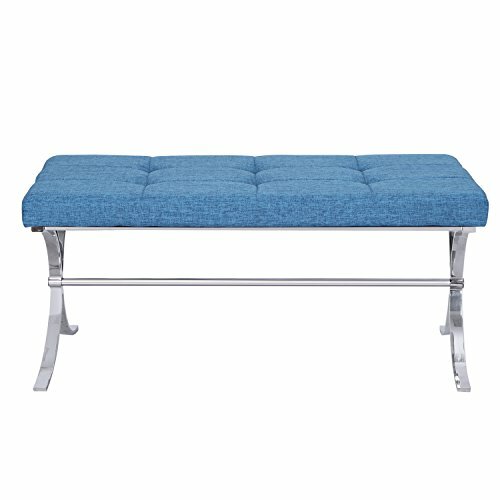 This stylish metal and faux-leather bench is the perfect choice for the front hall, or along a farm-style kitchen table. The sturdy base is constructed of glossy chrome, with a classy, curved x-leg design and connecting beam for added stability. The well-padded seat features a double row of button tufting with contemporary-style deep seams. Also doubling as a living room ottoman or coffee table, this trendy piece will look great in any room in the house. This piece is available in black or deep grey faux leather, or in purple, Blue, or grey fabric upholstery. If you have any questions about this product by Adeco, contact us by completing and submitting the form below. If you are looking for a specif part number, please include it with your message.